Up to 50% more battery life. Our best Android phone now has 27% faster performance* with a mighty 1.7GHz quad-core processor that easily keeps up with your multi-tasking demands. Quickly load web pages, watch videos plus get animations fast—and we mean fast! Gaming is seamless and immersive with exceptional picture quality. Never miss the perfect moment. One-press continuous shooting fires off 4 shots per second so you're sure to capture the perfect picture every time: such as the priceless look on your child's face as they catch their first baseball. With the exclusive HTC VideoPic you can shoot video and capture photos simultaneously. And if you miss a great shot while filming your video—just replay your footage and choose an actual photo from as many frames as you want. Don't just listen to your music—feel it with exclusive Beats Audio built in. It's the most immersive sound experience with deeper bass, crisper vocals and detailed high notes for all your music, games, movies and videos. You also get HTC's exclusive Music hub and Sync Manager for quick access to the tunes you love. Exclusive, immersive HD entertainment on the go. Rent or buy movies and shows from thousands of titles in HTC Watch 2.0. Enjoy it all on the brilliant HD screen or on the big screen thanks to HTC Media Link HD where you can wirelessly project all your favorite content onto any TV for everyone's viewing pleasure. All of these impressive, class-leading features are packed into a slim, lightweight polycarbonate unibody with a 2.5 D Gorilla Glass curved screen that flows around the phone's edges. 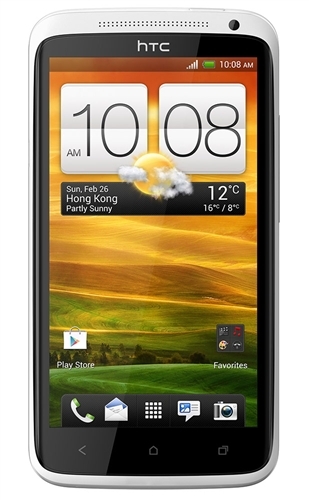 HTC One X+ offers viewing capabilities even at extreme angles. It's a sophisticated design that stands in a class all its own.